In the left part of the graph you can see the total debt development for the United States across the Household, Corporate, Government and Government Sponsored Entity sectors. You can see that Great Depression levels are being reached again. Not for every country data about debt levels are available for such a long period. There is data available however from 1980. In the right panel you can see the debt buildup for the three sectors combined (excluding financial sector) per decade as a percentage of GDP. 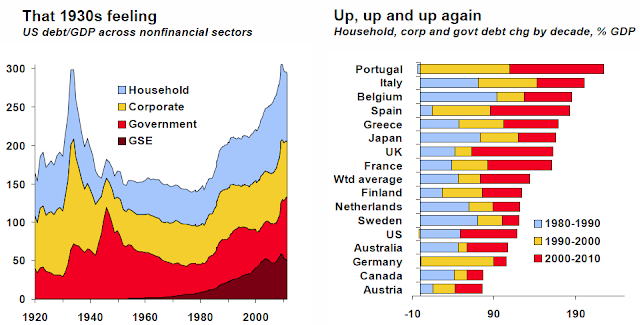 You can see that from 1980-1990 Belgium, Sweden, Italy and Japan had the highest debt buildup. From 1990-2000 Portugal, Spain, Germany and Italy had the highest increase. From 2000 until 2010 however, Portugal, Spain, U.K., France, U.S. and Greece were among the countries with the highest buildup in their debt across the three sectors.